I don't know about your little one, but mine loves nothing better than going out to eat. Research the restaurant beforehand. You don't want to find yourself in a restaurant that is not children friendly. There is nothing worse than having people looking and mumbling because your child is innocently making noise. Do they have a Childrens menu? if not are there foods on there that you know your child will eat. Bring your own snacks, I know it might sound strange to bring food along to a restaurant. But it doesn't hurt to bring snacks like dry cereal or crackers if your food takes a while to be brought to your table. Offer your toddler a choice. I notice my little one eats better when she picks her own meal. It makes her feel like a big girl, I don't worry about what she has chosen as most restaurants offer an array of meals with nutritious choices. Also this the perfect opportunity to introduce their foods by offering them to try a bite of what you are eating. Bring wet wipes, they are multi useful. From wiping down the table before your little ones eat, to wiping messy faces and hands after they have eaten. Most importantly, do not feel embarass by any of the mess made, resttaurants expect some degree of mess even from adults!! 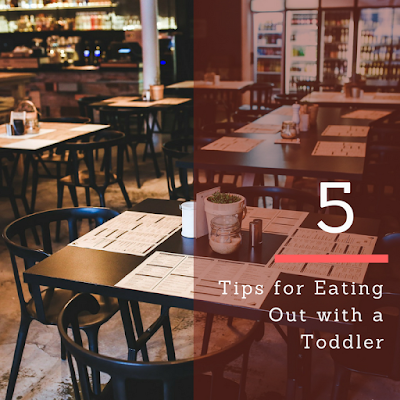 So those were my tips for eating out with a toddler, they are not fool-proof and I would be really interested to hear what your tips are.